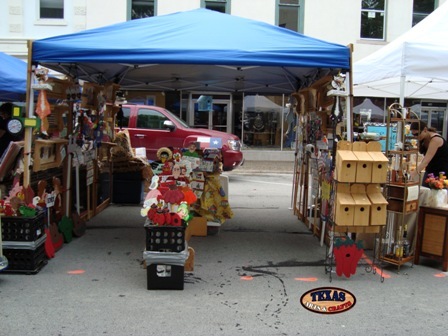 One of the craft shows we participate in is the Brenham Country Flavors Festival. The Brenham Country Flavors Festival is a combination of the Blue Bell Ice Cream Festival and the Garden Festival. The arts and crafts show is located in Brenham, Texas. It is approximately 60 miles north of Schulenburg. There will be Arts and Crafts, live entertainment, all you can eat ice cream for $6 (over 20 flavors), Old-Fashioned Cake Bake-Off, Blast From The Past Car Show, parade, and many other fun activities. The show starts at 10 A.M. and ends at 5 P.M.
We will set up our crafts at this show on Saturday morning. We will be selling bird houses, bird feeders, grandparent signs, funny saying signs, key rack shelves, animal crafts, spring crafts, summer crafts, Fourth of July crafts, and many other cute and fun items. What items we will have for sale depends upon our inventory, and what they can fit into our trailer. For more information about this show visit Downtown Brenham.